The best parts of this book were the mouth-watering recipes interspersed between the prose, and I've happily added several to my repertoire.That having been said, I couldn't bring myself to read the entire thing: about two-thirds of the way through, I tossed the book aside. Mallet's pretension, crotchetiness and misty-eyed sentimentalism combined to turn me off whatever vague thesis she was chasing through her meandering memories and whimpered protests against modernity.I'm no cheerleader for industrialized agriculture, but Mallet doesn't form a coherent critique of either the industry or the consumer capitalism which drives it. Loved this book. Bought it yesterday at a thrift store for $3.00 and started in on it right away. Finished it this evening.When I saw the author's name I remembered reading her obituary in the Globe and Mail. I read obituaries all the time, but this one stuck in my mind because Gina Mallet sounded like quite a character, if a little scary if you did not agree with her. (I just looked up the obituary online. Mallet was born in 1938 and died in 2013; the obituary was published on July 27, 2013. )Mallet's book, published in 2004, looks at changes in food through chapters devoted to the history and predicament of the egg, raw milk cheeses, beef, fruits and vegetables, and fish. This interesting material is interspersed with memories of living in Shillingford, Oxford, in the post-war years and then in an apartment above Harrods when the family moved to London in the 1950s. There were also trips to France. (Mallet's father was director of a chain of hotels, two of which were located in the South of France.) Mallet's mother was American, and her comments on English customs and idiosyncrasies are often amusing. And there are recipes! 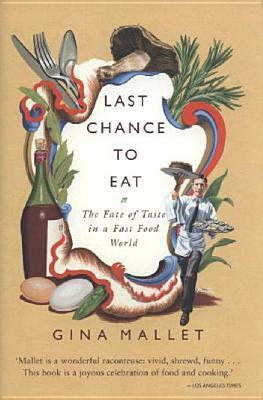 So I have shelved this book with my "memoirs with recipes," even though it is much more than a memoir.Gina Mallet was passionate about food, and I agree with her premise that we have gone from loving food to fearing it. The chapter on how the egg was almost done in over fears of cholesterol is particularly illuminating. I work in a health food store, and a trend in recent years is people choosing food solely on what it does NOT contain. I even had one customer complain to me that a certain packaged food did not contain a list of what was not in it. This, because so many foods are now marketed in that manner--gluten-free, wheat-free, dairy-free, etc. I told the customer that whatever was not listed as an ingredient was not in it. I had another customer refuse to buy a good-quality organic soup because the last ingredient listed was organic cane sugar, i.e., a little seasoning to balance the rest of the spices and seasonings. However, now I'm getting into a rant when the point of this is Gina Mallet's rants!I learned a lot from this book and enjoyed Mallet's witty style and her memories. And I will definitely try some of her recipes. I'm not sure how to categorize this book. It's part memoir, part investigative journalism, part nostalgia, with a handful of recipes, sprinkled here and there like party favors. Mallet divides the book into five sections: eggs, cheese, beef, kitchen gardens, and fish. I liked the egg section best and the beef section least. The focus of this book is taste--not health, economics, or environmentalism--and I found the focus refreshing. There's no guilt involved when you're only concerned about what tastes best. The memoir sections were fun, especially the descriptions of the food department at Harrod's during and after WWII. I loved this book.This book is sort of a combination of Fast Food Nation and The Omnivores Dilemma in that it looks at what our food consumptions and production used to be and now is, but it also mixes in a wonderful personal account as the author looks at this from her personal experience growing up in pre-WWII England and her experiences there to moving to America and how things have changed over the years.It not only looks again at the unhealthy and unsustainable practices we now employ in our food supply network, but it also looks at how our relationship with food and eating have changed and not necessarily for the better.As food science has increased our factual knowledge and overall productivity, we seem to have lost much of the pleasure and more practical knowledge of food, food prep and eating itself. We have gotten so caught up on the numbers and fears that the way our food is now produced inspire in us that food has almost become our enemy vs. a source of nourishment and please that it is alright to enjoy and I fear this is something we will never truly regain.For all that this was not a gloom and doom, look how horrible the food industry is book.It was truly more a fond and happy look back with family, culture and food using the current changes as more of a back drop than as the main centerpiece. Gina Mallet combines personal vignettes of family life in England during WWII (including recipes) with research about the ways in which government, science and business have DISTANCED us from the choices we make about the food we eat. You don't realize how great that distance is until you have read how eggs, cheese, meat, vegetables, fruits and fish have been "manipulated" in various ways at different times. It is interesting how she combines the history of food and chefs with information that we all need to take seriously, e.g. how the production of apples has been narrowly crafted by supermarkets. This book should provoke thought and reflection. Those of us who live in North America will realize that we are no longer close to our food, nor do we value it as we should - a sobering thought. It took me several attempts to get through this book. I persevered because it was so hyped. I should have trusted my instincts. I would be interested to understand what the author was trying to accomplish. Yes, food has changed, been industrialized... sometimes the details were too deep, and others not deep enough. I couldn't follow if Gina Mallet is a fan of GM or not - some of the book seemed muddled, and some of it not that interesting, and not one recipe that I thought mmm. Maybe it's a cultural, age thing but on the whole, I just didn't get this book. It's a little unfair to say that I read this book. But I did try. But I couldn't make it any further than about forty pages into the book. Mallet writes one hundred pages on the history of the egg!! If the first forty are any indication, I don't expect the next sixty to be any more interesting. I mean, just how do you make the history of the egg exciting? I don't deny it isn't possible, but Mallet is clearly not the author to do it (with apologies to those who enjoyed this book).Life is just too short to read boring books! Gina Mallet's book follows five popular foods from the Second World War to our present day. She laments the loss of taste that has occurred through mass production, and the American desire to have it fast rather than good. I wasn't really expecting to enjoy this book as much as I did. I found it rather fascinating, and it made me very hungry for the good food I ate while I was in Europe. Thanks for the recommendation, Rachel. Overall a very good representation of the fact that most Americans and Europeans are content to let the old and traditional dishes and ingredients go by the way side in preference to cheaper and faster food. The arguments are the same as Jeffrey Steingarten made in It must have been something I ate, unfortunately the author has nothing more to say than the fact that things are slipping away. Very compelling and thought-provoking. The first section of the book was about the humble chicken egg and its gastronomic origins. I enjoyed this book - there's a healthy smattering of history along with the author's food-related observations and experiences. Fascinating, delightful, and easy to read history of the transition of food from an adventure to savour and share to a barely nutritious, functional fuel. Makes you wonder, "Did eggs used to have a taste?" and "What does real cheese taste like?" Interesting and informative memoir shaped around the author's childhood memories of food. She argues that industrial food, for the most part, is devoid of taste and often not healthier than traditional foods, just more stable. This book is an interesting departure from most books about food. It reads almost like a story, with tales of the author's own childhood experiences and contrasting them to how things are now. And she makes interesting points. All in all, it was a very good read and I would recommend it. Lots of entertaining anecdotes & interesting histories. Some great examples to underscore the industrialization of our food and the fallout. Sometimes interesting, sometimes rambling. Facts, opinion and memoir all rolled into one. An interesting read about how the quality and taste of food has changed in our modern society. She includes some timeless recipes. This book was interesting for a while, a little bit of a different spin as the author grew up in London. But after a while it became tedious, and it was due back to the library, so I let it go. Very entertaining and informative book. An aristocrat's take on how all of the taste was stolen from our food. I love food. God food. I love cooking. Loved this book! Due a re-read.